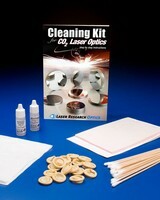 Lens Cleaning Kit helps maintain CO2 laser optics. Designed for CO2 laser optics used in harsh industrial environments, LRO Cleaning Kit for CO2 Laser Optics features proper procedures for removing spatter and blow-back from lenses and mirrors. Providing complete, step-by-step cleaning instructions, kit includes supply of alcohol, acetone, cotton-tipped swabs, lens paper, and finger cots for safe handling. A new lens cleaning kit that is especially designed to prolong the life of CO2 laser optics used in harsh industrial environments is being introduced by Laser Research Optics of Providence, Rhode Island. The LRO Cleaning Kit for CO2 Laser Optics was developed for lasers used in harsh environments and features the proper procedures for removing spatter and blow-back from lenses and mirrors. Cleaning will help prevent damage to the coatings, improve their transmission performance and prolong the life of CO2 laser optics used in harsh environments, claims the firm. Providing complete, step-by-step cleaning instructions, the LRO Cleaning Kit for CO2 Laser Optics includes a supply of alcohol, acetone, cotton-tipped swabs, lens paper, and finger cots for safe handling.